The Federal Ministry of Environment with the collaboration of sister agencies has spread its tentacles across the nation’s borders to check the illegal trading in wildlife. 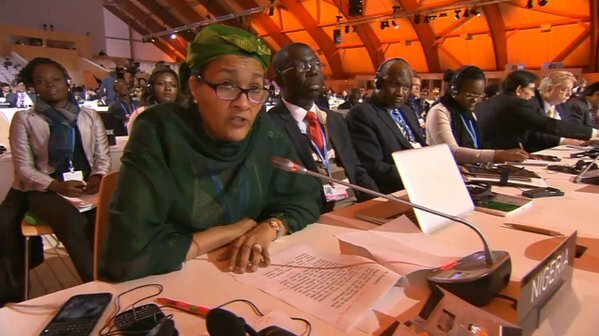 Minister of the Environment, Amina J. Mohammed, who announced this in a message to commemorate the World Environment Day celebration in Lagos, also enjoined all Nigerians to join in the war against the illegal trading in endangered species of fauna and flora, to conserve them for the future generation, as well as generate revenue for host communities and the nation. The minister, who was represented by the Controller, Federal Ministry of Environment (FME) in Lagos, Agbenla Oluwatoyin, assured that the country would fully meet the recommendations by the Convention on International Trade in Endangered Species of Fauna and Flora (CITES), which it is a signatory to. Mohammed explained that through the collaboration of the Nigerian Immigration Service and other institutions, traders in engendered species are being intercepted and handed over to the police for prosecution. “The National Environmental Standards and Regulations Enforcement Agency (NESREA) is the enforcement arm of the FME. We are investing hugely on monitoring. Once any one runs fowl of the law, apart from the fact that the animal or animal parts are seized from him or her, the person is handed over to the police for prosecution. Nigeria is signatory to many conventions on wildlife protection, one of which is the CITES. So we are compelled by law to enforce it,” she said. She added,“Illegal trade in wildlife is the exchange of undomesticated animals and plants from their natural habitat against established rules and regulations. This has led to wildlife crime which covers different kinds of criminal activities such as poaching, capture/collection of fauna and flora from the wild, smuggling, possession, and illegal import or export of endangered species of wild fauna and flora. The criminal activities differ from country to country depending on the fauna and flora available. Some of the world’s illegal trade in endangered species of wild fauna and flora include: poaching of elephants and rhinoceroses in Africa for ivory and horn respectively; smuggling rare parrots captured in the rain forests of Brazil, tortoise, turtles and other reptiles; collection of eggs of wild birds; trafficking in bears’ gall bladder and tiger parts, etc." “Illegal wildlife trade is a challenge because it has the potential to be very damaging. Population of species on earth declined by an average of 40% between 100 and 2000; and the second biggest direct threat to species survival, after habitat destruction, is wildlife trade," she said. "However, the most obvious problem associated with illegal wildlife is that it can cause over exploitation to the point where the survival of a species hangs in the balance. Such exploitation has caused extinction or severely threatened species, and as human population increases, the demand for wildlife also increases." In a lecture, a Deputy Director of Forestry at the FME, Dr. Elizabeth Ehi-Ebewele, said the collaboration with communities in checking the killing and smuggling of wildlife should be strengthened. “They go to all the nooks and crannies destroying our forests. They collaborate with community people, and gain access to the bush. They kill any elephant, any mammal, including the young ones and those that are pregnant. To them, what is important is money. They have no regard for the future,” she stated. This, according to her, is necessary because wildlife traffickers from China and others succeeded because they collaborate with local people. In an address, Chairman of the occasion, Alhaji Lateef Suberu, a wildlife expert, advised the authorities to give more impetus in enforcement of laws against poaching and illegal trading to secure its wildlife. He said: “What is the need for laws when they are not enforced to the letter? Nigeria really needs to wake up, else we will just wake one day and see that the wildlife has all disappeared. Illegal trade in wildlife as you know is not a new practice, it has been in occurrence for many years and is still booming. It is fully detrimental to our beautiful heritage. UNEP states, ‘The killing and smuggling is also undermining economies and ecosystems, fuelling organised crime and insecurity across the globe’. The event featured the exhibition of body parts of wildlife animals including ivory from elephants and rhinoceros, the skins of python, tiger, and crocodile, and the shells of sea turtle, to the admiration of many school children. Some of the students and pupils said they were happy to see how the animals look like in real life, and called on government to ensure the proper conservation of the wildlife so that the future generations will see them. “I am really happy to see these animals because I have not seen them before. What I learnt is that these animals deserve to live so that school children will know more about them and also the future generations will see them not to only read about them in books,” said a student.